To see what is happening on Jupiter's closest moon, Io, a change in language and theory is required. Mechanical, electrically sterile terminology only hinders understanding. 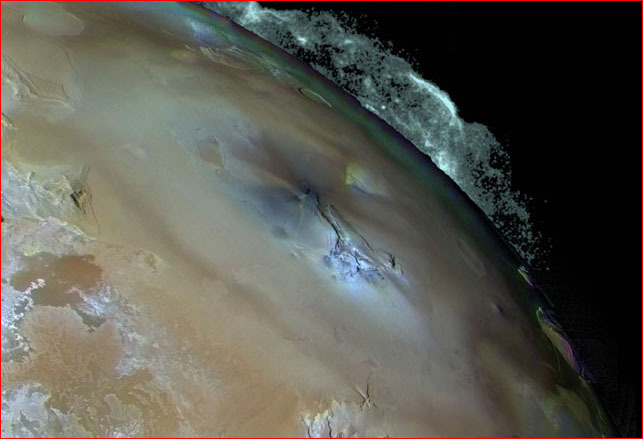 Pictured above: the plumes of the “volcano” Pele, on Jupiter’s moon Io. As plasma physicists look at astronomy and astronomers look at plasma, the respective languages, cultivated over many decades, can only accentuate the gap in viewpoints. The language of “plasma cosmology,” describing the formation of galaxies, stars, and planets, includes many terms more familiar to electrical engineers than to astronomers--Langmuir sheaths, z-pinches, glow discharges, arc discharges, plasmoids. Astronomers have cultivated a different language. Having banished charged plasma from space, they concentrate on the much simpler behavior of a “magnetized gas”, not the charge. Their equations for the behavior of plasma are typically those used to describe flowing water and blowing wind, with a modification due to magnetic effects—the math of classical mechanics. Thus, their lexicon reflects their perspective, with words one might expect from a weatherman—winds and jets, bowshocks and shock waves, winds and rains of charged particles, wind socks, etc. What NASA scientists call a "surprising rain of charged particles" in the vicinity of Jupiter’s moon Io is interesting and dangerous weather for spacecraft. But in an electric universe the phenomenon means much more than a cosmic weather report. It is a signature of electrical activity that could not fail to produce a continuous stream of surprises for those unaccustomed to the behavior of electrified plasma. Jupiter and its moons form a small-scale model of the solar system and should therefore be a test of hypotheses about its formation. But despite the money, time and effort spent on the Galileo mission to Jupiter it ultimately failed to provide satisfactory answers about the remarkable environment of the gas giant. When Cornell astrophysicist Thomas Gold proposed in the journal Science (Nov, 1979) that the “volcanoes” on Io were actually plasma discharge plumes, he was “answered” in the same journal by Gene Shoemaker et al. But it is dismaying to see that, despite a cascade of data in favor of Gold’s original insight—and no new data in support of the more conventional interpretation--neither Science nor any other respected journals revisited the issue. Could it be that the wrong hypothesis was chosen to interpret the data from Galileo? Science functions best when there are a plurality of ideas to be tested, so that when surprises arise, we will be aware of those who were NOT SURPRISED by the new findings. The Electric Universe model asks us to also consider the circuit between Jupiter and the Sun, and the Sun and the galaxy. Io can then be seen in proper perspective as a hapless intermediary in the more powerful electrical exchange between Jupiter and the Sun. Only with this more universal perspective can the right questions be posed and coherent answers be expected. See also: Io and the "Greatest Surprise"